Cucumber and mango is a classic combination of unexpected proportions. These healthful and wonderful ingredients can be paired in a refreshing cucumber and mango smoothie with coconut milk, spinach and mint leaves; you can create a spicy mango salsa to smother your chicken fajitas; turn them into a chutney or even a chilled mango and cucumber soup. Ideas abound where cucumbers and mangoes are concerned. Plus, this recipe happens to be a simple, raw salad for two, giving you the chance to eat your vitamins and minerals, nourish your skin and make you smile – all at the same time. Mangoes are an ancient fruit, most notably the “King of Fruits” in India, where they were first cultivated many centuries ago. It just so happens that we love them the world over, because of their amazing flavor and texture. A single cup of mango provides 100% of the daily recommended value of vitamin C, it is also rich in potassium, B6 and vitamin A. So, in essence, this salad is good for your eyes, your bones, your glowing skin – it is good for you, period. We don’t see any real reason not to eat it, knowing all too well the benefits of cucumbers too (also wonderful in blueberry smoothies, by the way). If you are in search of a light salad, this is the one to sample first. It goes perfectly with any protein source, and it complements Hasselback potatoes with Paleo sour cream beautifully. In a bowl whisk the olive oil, lime juice, jalapeño and vinegar; season to taste. 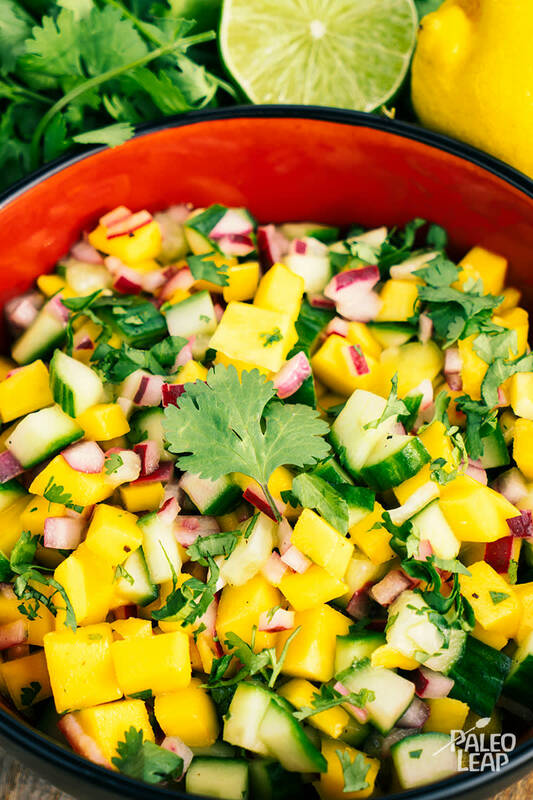 In a salad bowl combine the mango, cucumber, onion and cilantro. Pour the dressing over the salad, gently toss and serve.